CREATING THE WORLD IN MINIATURE isn’t easy. The detailed craftsmanship of globe making has been refined over centuries—requiring multiple steps and often multiple artists. In the 1955 video above archived by British Pathé, the skilled globe makers at an unspecified North London firm of geographers take viewers through the fascinating process step-by-step. The globe makers start by applying thick, brown strips of paper around a wooden ball to create the shell, which is then coated in nine layers of plaster. At the 52-second mark, you can see the globe maker slather fistfuls of the wet plaster over the shell, spinning the sphere so the surface comes out smooth and creamy. This step alone takes about six hours, the narrator explains. It’s an important step that can significantly affect the end product if there’s an error. “The covering process calls for a keen eye and a steady hand,” the narrator says. Various shots show the processes involved in manufacturing globes at a factory. The maps are drawn onto stone with a diamond cutter, working from the original draughtsmen's maps. Then a printing block is made and the different sections of the maps are printed on large machinery. The sections are cut out by hand, pasted with glue and stuck onto the plain globe. The globe is then varnished. Gold alone found on the sea floor is estimated to be worth $150 trn. But the cost to the planet of extracting it could be severe. Diva amon, a researcher at the Natural History Museum in London, spotted her first whale skull in 2013, during an expedition to the Clarion Clipperton Zone (ccz) in the tropical Pacific. It sat on beige silt, some 4,000 metres beneath the sea’s surface, and was entirely covered in a black coating. Her find was twice notable. First, the skull’s coating meant it was millions of years old, for it was made of the same slowly accumulating metallic oxides as the potato-like ore nodules that are drawing miners to the area. 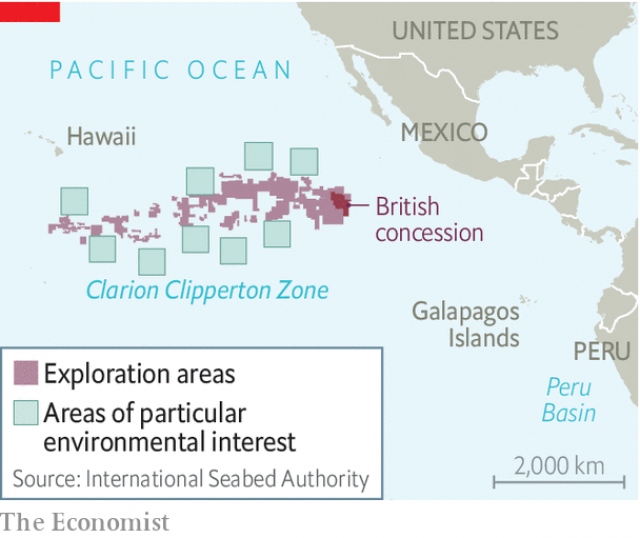 Second, the discovery highlighted how little is known about the deep ocean. Dr Amon’s whale skull, and others like it, raise questions about the trade-offs between the economic gains of mining the seabed and that mining’s environmental consequences. 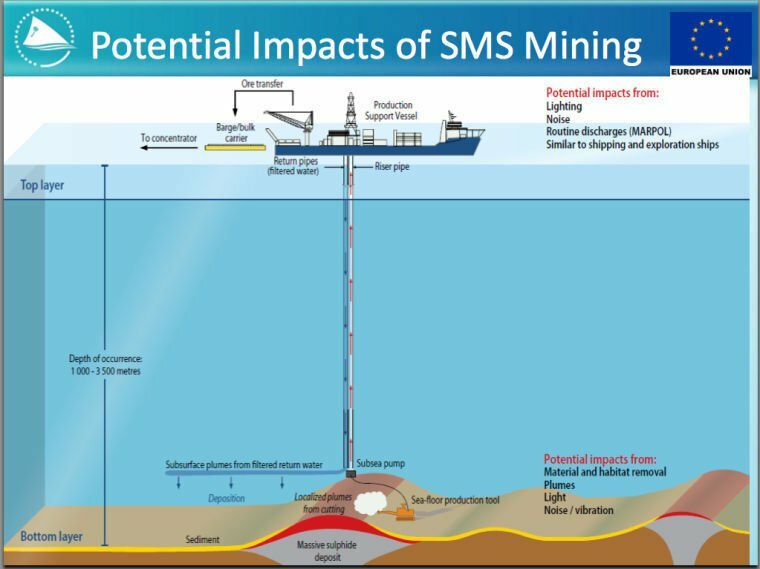 Those involved in deep-sea mining hope it will turn into a multi-billion dollar industry. Seabed nodules are dominated by compounds of iron (which is commonplace) and manganese (which is rarer, but not in short supply from mines on dry land). However, the nodules also contain copper, nickel and cobalt, and sometimes other metals such as molybdenum and vanadium. These are in sufficient demand that visiting the bottom of the ocean to acquire them looks a worthwhile enterprise. Moreover, these metals seldom co-occur in terrestrial mines. Though their location several kilometres beneath the ocean surface makes the nodules hard to get at in one sense, in another they are easily accessible, because they sit invitingly on the seabed, almost begging to be collected. Most are found on parts of the ocean floor like the ccz, outside the 200-nautical-mile exclusive economic zones of littoral countries. They thus fall under the purview of the International Seabed Authority (isa), which has issued 17 exploration licences for such resources. All but one of these licences pertain to the ccz, an area of about 6m square kilometres east-south-east of Hawaii. The licensees include Belgium, Britain, China, France, Germany, India, Japan, Russia, Singapore and South Korea, as well as several small Pacific island states. America, which is not party to the United Nations Convention on the Law of the Sea that established the isa, is not involved directly, but at least one American firm, Lockheed Martin, has an interest in the matter through a British subsidiary, uk Seabed Resources. And people are getting busy. Surveying expeditions have already visited the concessions. On land, the required mining machines are being built and tested. What worries biologists is that if all this busyness does lead to mining, it will wreck habitats before they can be properly catalogued, let alone understood. The first task, therefore, is to establish what exactly lives down there. At first glance, the ccz’s abyssal plain does not look of much interest. It is a vast expanse of mud, albeit littered with nodules. But, though life here may not be abundant, it is diverse. Craig Smith, an oceanographer at the University of Hawaii, Manoa, who studies the ocean’s abyssal plain, says that the ccz contains a greater variety of species than the deep seas off the coasts of California and Hawaii. Some of the ccz’s creatures stretch the imagination. There is the bizarre, gelatinous, yellow “gummy squirrel” (pictured), a 50cm-long sea cucumber with a tall, wide tail that may operate like a sail. There are galloping sea urchins that can scurry across the sea floor on long spines, at speeds of several centimetres a second. There are giant red shrimps, measuring up to 40cm long. And there are “Dumbo” octopuses, which have earlike fins above their eyes, giving them an eerie resemblance to a well-known cartoon elephant. Every expedition brings up species that are new to science, many of them belonging to biological families that are also novel. At a conference in Monterey, California, in September, Dr Smith presented results of a biodiversity survey carried out in the British concession, which sits at the eastern end of the ccz. Of 154 species of bristle worms the surveyors found, 70% were previously unknown. Dr Smith says the concession may be part of a biodiversity hotspot, one which would not be represented in the nine protected areas of environmental interest that have been set aside in the ccz. He therefore argues for the establishment of a tenth such area, on the margins of the concession. 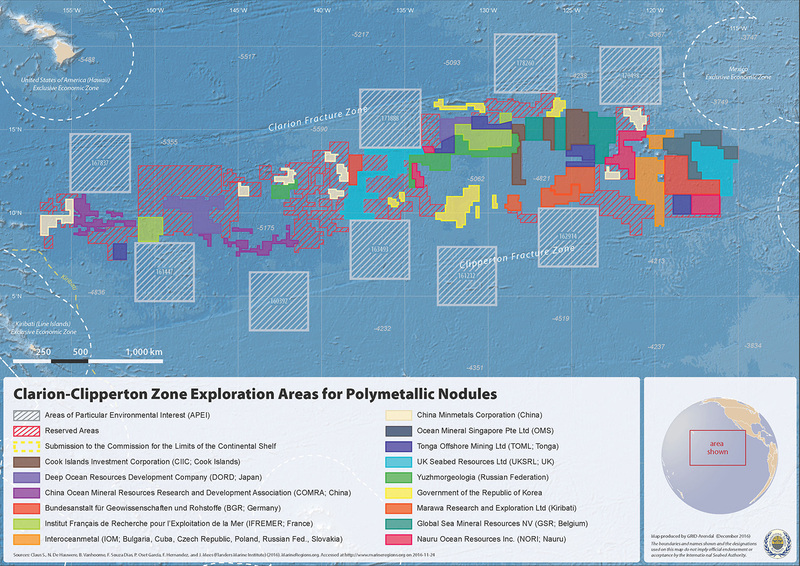 GSR's exploration activities in the Clarion Clipperton Zone (CCZ) focus on three major elements: resource assessment, technology and environment, all of which are shown in this 12-minute video covering the company's 2017 Pacific campaign. To verify resource estimates undertaken during GSR's 2014 and 2015 campaigns, nodules were collected using deep-sea dredges and box cores. The technological aspects involved the deployment of 'Patania I', the first tracked vehicle to reach and travel the seafloor at depths of more than 4,500 m.
Meanwhile scientist from both GSR and independent research institutions collected baseline data to better understand sites that may be subject to mining in the future and ensure that any such activities only proceed once the environment impact has been judged acceptable by the international community. The ocean’s largest inhabitants may also be visitors to the ccz. This summer Leigh Marsh of Britain’s National Oceanography Centre, in Southampton, described more than 3,000 large depressions in the mud there. These formed a series of curved tracks. Similar tracks elsewhere have been linked to whales scraping themselves against the seafloor. Dr Marsh and her colleagues suggest that deep-diving whales may be foraging on the ccz seafloor, using it as a giant loofah to scrape parasites from their skins or even ingesting the nodules as ballast. If true, this would significantly extend the depth to which whales are known to dive. The only direct evidence of whales in the ccz, though, comes in fossil form. In Monterey, Dr Amon set the audience buzzing when she presented preliminary data suggesting that the region contains large deposits of fossil whale bones. Such fossils were first noted by the Challenger expedition, a world-spanning investigation of the deep ocean conducted in the 1870s by a British naval research vessel. Dr Amon’s find back in 2013 prompted her and her colleagues to go through tens of thousands of images gathered by various exploration submarines. These recorded 548 cetacean fossils from a range of species. Among the oldest was Choneziphius, an extinct animal that lived more than 10m years ago. Although this work was a study of photographs, rather than of the remains directly, which could cast doubt over some of the identifications, the metallic-oxide coating of many of the bones gives a sense of how old they are. Because of the density of fossils, Dr Amon says the ccz may be a previously undiscovered, and rare, submarine fossil bed. Why whale fossils would accumulate in this particular spot is unknown. Possibly, those elsewhere are simply buried. The ccz sits beneath the ocean’s clearest waters, so its sediments accumulate extremely slowly. But it may be that some as-yet-unknown physical process is keeping the fossils and the (equally old) nodules at the surface of the silt. Indeed, why the nodules are exposed is one of the great mysteries of the region. Regardless, Dr Smith, Dr Amon and others hope the bones’ presence will be taken into account as the isadrafts the rules and regulations for exploitation of the ccz. Whale fossils, sea cucumbers and shrimps are just the stuff that is visible to the naked eye. Adrian Glover, one of Dr Amon’s colleagues at the Natural History Museum, and his collaborators spent weeks peering down microscopes, inspecting every nook and cranny of the surfaces of some of the nodules themselves. They discovered a miniature ecosystem composed of things that look, at first sight, like flecks of colour—but are, in fact, tiny corals, sponges, fan-like worms and bryozoans, all just millimetres tall. In total, the team logged 77 species of such creatures, probably an underestimate. Inevitably, much of this life will be damaged by nodule mining. The impacts are likely be long-lasting. Those nodules will be carried up several kilometres of pipes back to the operations’ mother ships, to be washed and sent on their way. The size and power of the submersibles means that they will leave large tracks in their wake. These are likely to persist for a long time. Evidence for this comes from various decades-old disturbance experiments. In 2015 an exploratory expedition by ifremer, a French government agency responsible for oceanography, noted that even mobile animals like sea urchins were 70% less abundant within 37-year-old experimental tracks than outside them. The largest disturbance experiment so far was carried out in 1989 in the Peru Basin, a nodule field to the south of the Galapagos Islands. An eight-metre-wide metal frame fitted with ploughs and harrows was dragged back and forth repeatedly across the seabed, scouring it and wafting a plume of sediment into the water. In 2015 a research vessel returned to the site. Down went the robots, samplers and submarines with their scanners and cameras. The big question was, 26 years after the event, would the sea floor have recovered? The answer was a resounding “no”. The robots brought back images of plough tracks that looked fresh, and of wildlife that had not recovered from the decades-old intrusion. Another concern, in the wake of the Peru Basin experiment, is sediment. This will be both stirred up during collection, as the robots crawl across the sea floor and hoover it, and washed off the nodules at the surface when they are cleaned. Ideally, a second pipe would deliver those washings directly back to the seabed, in order to keep disruption in the water column to a minimum. In practice, dumping silt overboard will be much easier. Decades of failure to police overfishing demonstrate how hard it is to regulate activity on the high seas. If silt were dumped in this way it could be disastrous. A steady stream of the stuff raining down from the surface would affect everything along the way, especially filter-feeding animals such as sponges and krill, which make their livings by extracting small particles of food floating in the water. The effect both in the water column and on the sea floor might not be so great in other parts of the oceans, say biologists, but life in the crystalline ccz is wholly unadapted to murky waters. All of this needs to be balanced against the impacts of mining the equivalent amounts of minerals on land, however. The ccz covers about 2% of the deep ocean. A 20-year operation within it would affect of the order of 10,000 square kilometres—about a six-hundredth of its area—according to Mr Van Nijen. And, unlike mining developments in virgin areas of dry land, which tend to bring other forms of development in their wake by creating transport links that encourage human settlement, no one is going to follow the nodule-hoovers and actually live on the abyssal plain. In the end, the only way to measure how mining would change the bottom of the ocean may be to conduct small-scale pilot operations. The first will take place next April, when gsr will lower Patania II, an enormous green tractor, to the bed of the ccz. Patania II is a prototype nodule collector. It will clear areas roughly 300 by 100 metres, leaving them nodule-free, so that future expeditions can return and study recolonisation rates. An array of sensors suspended in the nearby water will monitor the resultant silt plume, which the company’s models suggest could travel up to 5km—not the hundreds of kilometres that some have suggested. To scrutinise this trial independently, jpi Oceans, an intergovernmental research body, has paid for the Sonne, a German research vessel, to sail alongside gsr’s. As Mr Van Nijen puts it, “We need to validate our equipment, but from an environmental perspective, the world’s first mining test at depth is a unique opportunity for scientists to study the impacts. That sounds like a promising start. But however careful the miners are, life for the inhabitants of the ccz is about to get a lot less peaceful than it has been for millions of years. From Medium by Eneli Toodu, Intertrust Tech. Either on TV or in real life, we have all seen a beautiful scene of the ocean where the waves roll smoothly from sea to shore. There are often even surfers trying to catch these large waves to experience the ocean’s power. However, have you ever considered where these waves come from or what distances they travel to reach the shore? The majority of large waves on the ocean surface are generated by big storms. Storms function as a wave generator, producing waves that travel outwards from its center and across the surface of the sea. These waves consist of a mix of swell and white caps with different sized surf radiating away from the area under the storm. These waves are able to push beyond the boundaries of a storm due to the wave propagation speed being faster than the storm motion itself. Wavelength is the distance between waves, and typically, waves in larger sizes travel faster due to their longer wavelengths. As different sized waves travel away from the storm area, they’ll disperse at different speeds. Ocean and wave conditions differ dramatically across both distances and days. However, waves with equal wavelengths can be nearly evenly spaced across distances. These waves are commonly known as swells. As these swells consist of similar wavelength waves, they travel at the same speeds, punctuated across the surface of the ocean. Longer and faster waves on the other hand, push ahead of their smaller counter parts, leaving shorter, slower waves radiating from the center of a storm behind the rest. To understand why different waves move at different speeds we need to know that wave speed is both a function of wavelength and wave period, and is related to the wind velocity where the waves form. Wave period is dictated by the period of time that passes between waves and is directly related to the speed the wave is travels at. Wave speed is determined by dividing the wavelength (L) by the wave period (T). If the wave period is longer, the wave is faster and more powerful. Additionally, the greater the period, typically the higher the wave breaks as it gets to the shore. This is contributed to the fact that a longer period swell impacts water much deeper in the ocean than short period swells. The main factors that affect wave characteristics are wind speed, storm duration, and fetch. Fetch is the distance wind blows over the open water. In layman terms, if we have large fetch, long duration and strong winds, there will be large, long period waves. 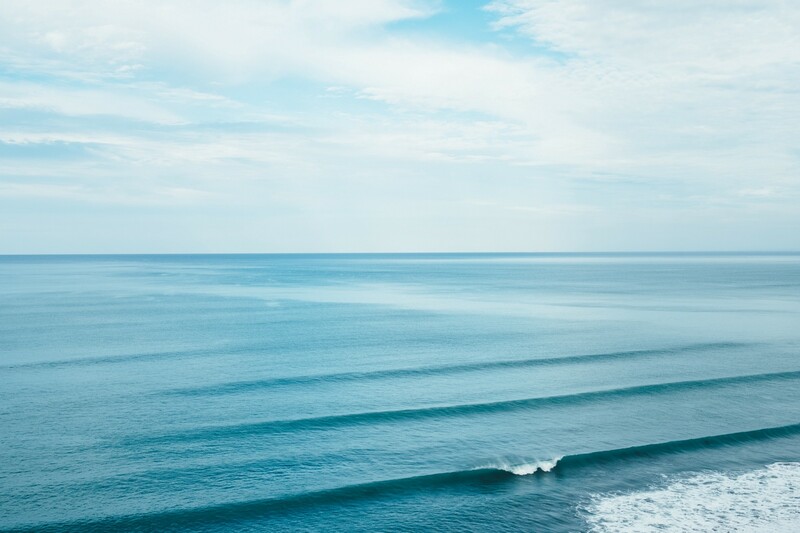 Furthermore, the waves that have dispersed from their generation area are separated according to their speeds and wavelengths (called swell waves). Swell direction is the direction from which the swell is coming and is measured in degrees. If we now look at the animation above, where Typhoon Yutu brews over the Western Pacific ocean, we can see a similar swell formation. The wind barbs shown on the animation show wind speed and direction. Significant height of primary swell waves and wind speed barbs over the Western Pacific Ocean from October 23rd to October 27th, 2018. The values above are masked out by NOAA, as we visualize their WaveWatch III dataset by using Planet OS API. The reason why there is no significant swell height values in the middle of the typhoon is due to the variable uncertainties from the huge storm with its messy, chaotic wind and wave patterns. Once waves start to travel away from the eye of the storm, their accompanying swell values are also observed. In this animation, we can see more precisely how waves with different height become separated by the wave propagation speed. Additionally, these same waves that are formed within typhoon reach the shore of Japan only a few days later, crossing a distance of over 1200 miles (2000 km). But, notably, the typhoon isn’t the only force that generates waves, there is also another smaller storm brewing near Japan that produces an additional small swell. In the next animation, we have shown the mean period of primary swell waves during the same time frame. Here we wanted to show how different wavelengths travel at varying speeds. Again, with the longer wavelength of a wave meaning the longer the wave period. Below, we can see how longer periods reach the shore faster than waves with shorter periods. 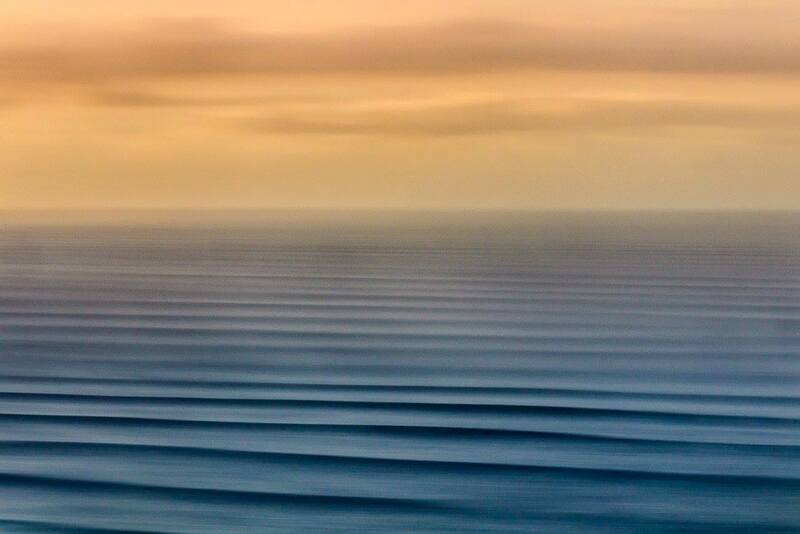 As waves increase in size, the accompanying colors increase in brightness. Mean period of primary swell waves from NOAA ww3 dataset. Model data effectively communicates the theory of swell wave propagation. Thanks to the NOAA ww3 dataset, we are able to make animations of swell propagation near Typhoon Yutu and more. 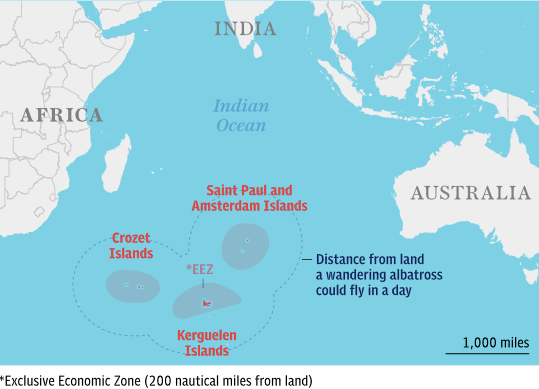 Their locations will be transmitted to the French navy, which will use the data to identify vessels fishing in prohibited waters in the Indian Ocean, off the remote French islands of Crozet, Kerguelen and Amsterdam. 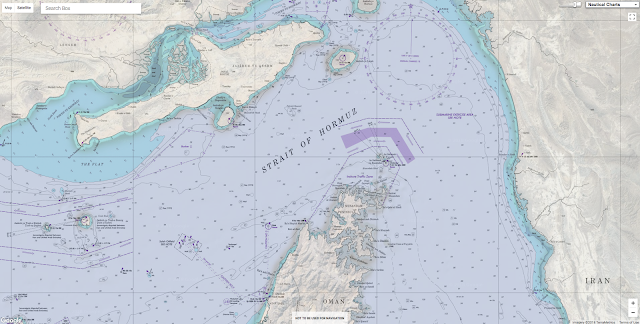 France is responsible for patrolling some 260,000 square miles of the southern sea. Sailing without radar in the rough waters of the Indian Ocean would be extremely reckless. “Radars mean safety, especially for illegal ships that have to detect and avoid naval vessels,” said Henri Weimerskirch of the Chizé Biological Research Centre in western France. Birds are hunting illegal fishermen: those illegally fishing the Indian Ocean will soon find they have more to worry about than the proverbial albatross around their neck—real bad luck might now lurk in the form of one of the birds spying on them. 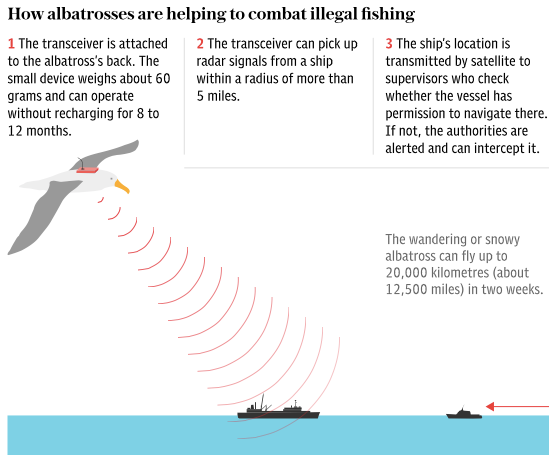 Between November 2018 and March 2019, 150 albatrosses, from the French Indian Ocean islands of Crozet, Kerguelen and Amsterdam, will be equiped with tiny beacons which will automatically detect radar signals put out by ships they meet at sea. 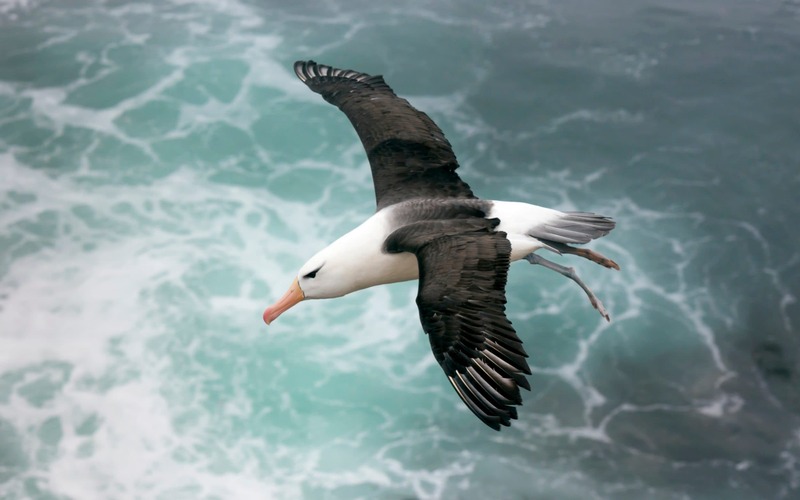 The transceivers, weighing less than 60 grams, will be mounted on the albatrosses’ backs. They can pick up radar signals within a radius of more than three miles. 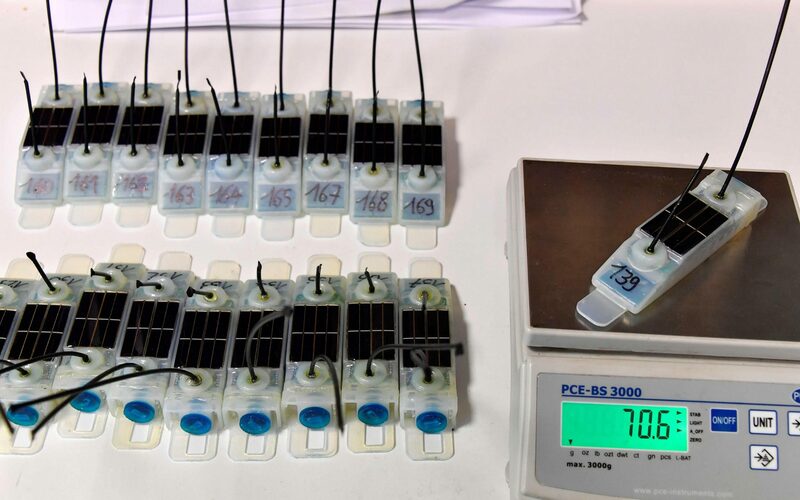 Scientists will also use them to track the birds and analyse their feeding habits. 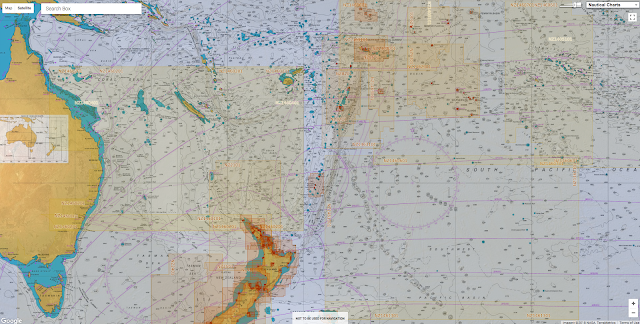 The programme known as "Ocean Sentinel" and funded by the Council of Europe was first tested In South Africa early this year, Vessels intent on illegal fishing turn off their automatic identification system (AIS) when entering off-limit fishing grounds, so cutting themselves off from automatic satellite tracking. Half the boats detected during the test phase did not have their AIS switched on. 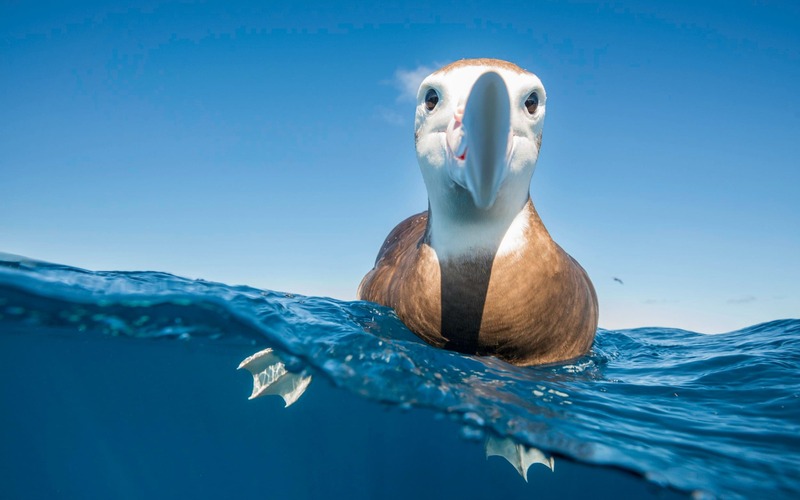 Eighteen of the 22 species of albatross are threatened, some with extinction, according to the International Union for the Conservation of Nature. Commercial longline fishing poses a major threat to seabirds. Hundreds of thousands of birds drown each year after being ensnared in fishing lines or nets as they swoop down to catch fish. 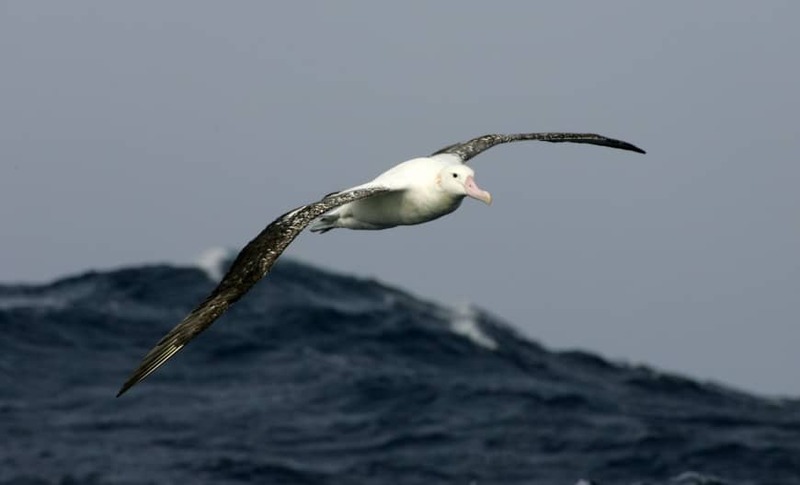 The transceiver beacons, developed by scientists from France and New Zealand, will be fitted on albatrosses over the next five months in an operation known as “Ocean Sentinel”. Further trials are also to be carried out next year off New Zealand and Hawaii. Chinese-flagged vessels have often been suspected of breaching international regulations, according to campaigners. Others have been registered in Panama, Belize or Malaysia, but even when ships are tracked with GPS and satellite systems, catching them in the act and taking their owners and operators to court can prove difficult and costly. 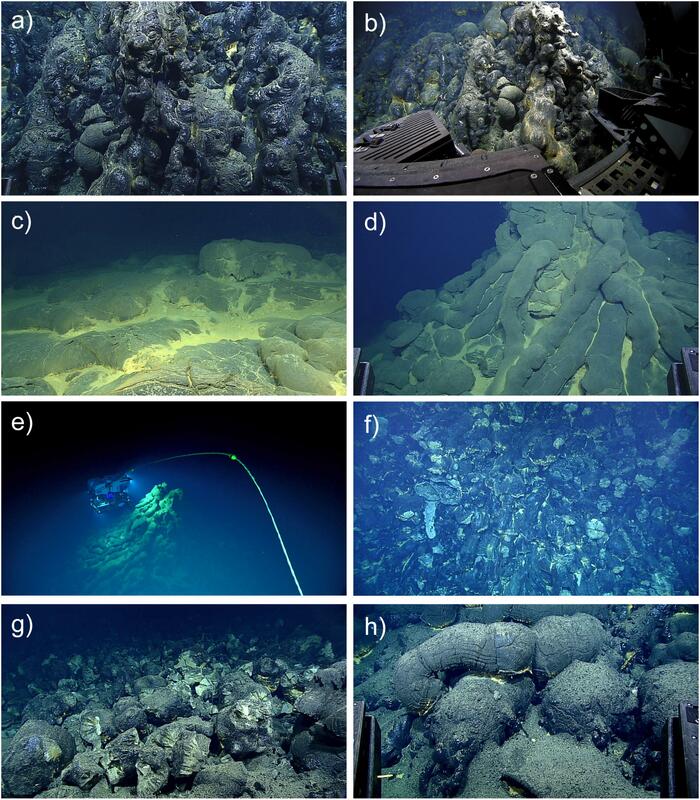 Various images made by the Deep Discoverer, a remote operated vehicle, showing lava deposits made by the eruption, including pillow tubes, glass and other formations. Images from ROV Deep Discoverer dive EX1605L1-09 on 29–30 April 2016, which crossed the northern-most and thickest of the 2013–2015 lava flows. Numbers in parentheses are time of photo in GMT and horizontal scale. (a)Pillow lavas with extremely glassy finger-like buds (03:41:31, 2 m). (b) ROV set up to sample a glassy pillow bud (03:49:32, 4 m). (c) Broader lobes on top of one of the pillow mounds with hydrothermal sediment (00:03:48, 5 m). (d) Conical eruptive center at the top of a mound with radiating pillow tubes and hydrothermal sediment (02:43:00, 6 m). (e) View of ROV illuminating a conical eruptive center (02:40:20, 20 m). (f) Nearly vertical cliff with intact and truncated pillows (01:12:11, 10 m). (g) Primary pillow talus at base of cliff (01:06:06, 3 m). (h)Fragmental deposit on top of pillows beyond the talus apron (01:03:14, 2 m). Close to the Mariana Trench and nearly three miles below sea level, scientists found evidence of an underwater eruption that was only months old. In 2015, an international team of researchers sent robotic submersibles beneath the waves north of Guam. They had set out to study an area south and west of the Mariana Trench — the deepest groove in Earth’s oceans — and an arc of volcanoes, hoping to spy hidden hydrothermal vents. Instead, they discovered a spectacular glassy labyrinth, nearly three miles below sea level. It was recently cooled lava, the product of the deepest underwater volcanic eruption ever recorded by scientists. 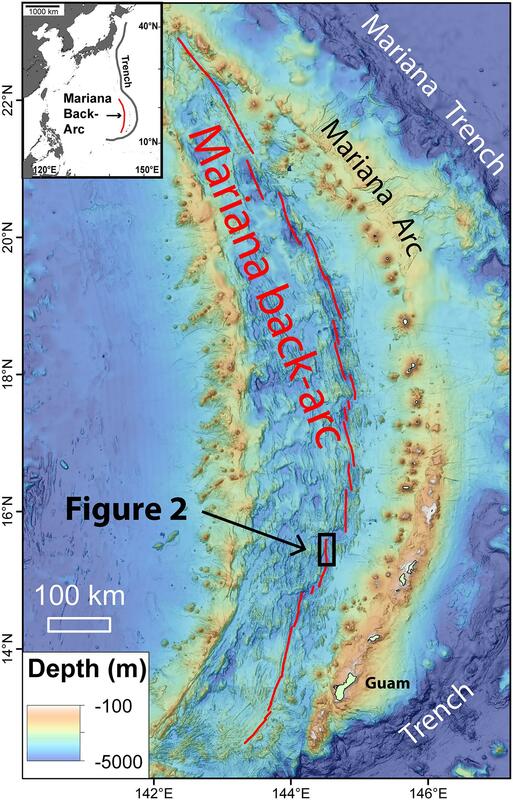 Regional map showing location of the study area on the 15.5°N segment of the Mariana back-arc. Black box shows area of Figure 2. Inset map shows the location of the Mariana back-arc relative to the western Pacific trenches, with Japan to the north and the Philippines to the west. 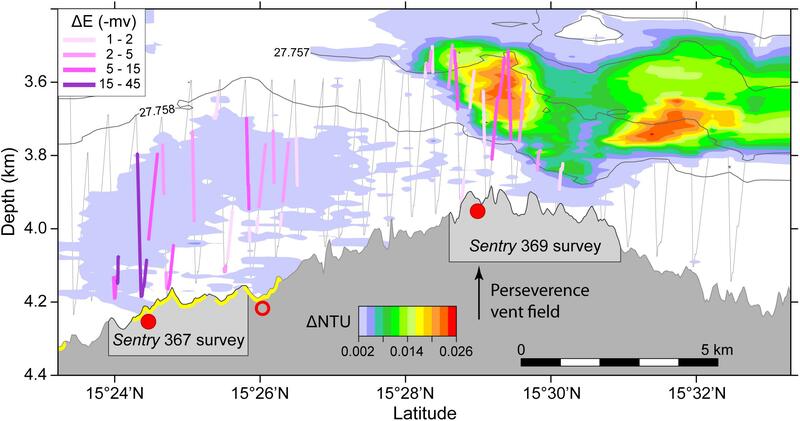 Bathymetric map of the 15.5°N segment of the Mariana back-arc showing the location of CTD tow T15B-06 (red line; data shown in Figure 3), AUV Sentry dives 369 and 367 (white lines; the latter shown in Figure 4), and areas of depth change between bathymetric surveys in 2013 and 2015 (black outlines; data shown in Figure 6). 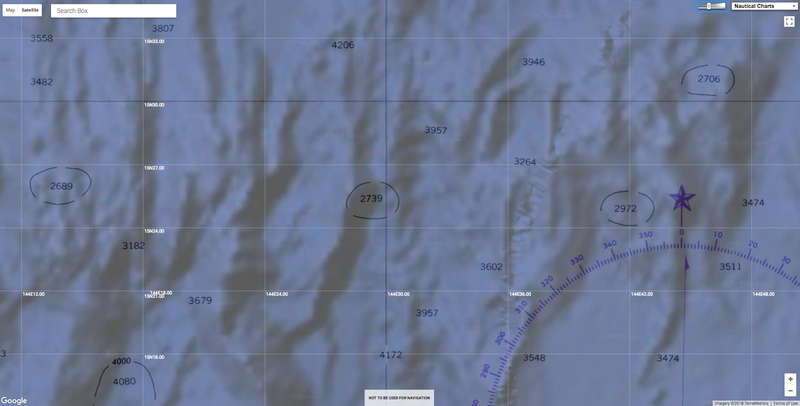 Red dot shows location of Perseverance vent field. The researchers reported their discovery last week in Frontiers in Earth Science. Depth cross-section along the axis of the 15.5°N segment of the Mariana back-arc showing data from CTD tow T15B-06 (from Baker et al., 2017). Colors above seafloor show turbid particle plumes as ΔNTU anomalies. Colored lines along CTD tow path (gray zigzag lines) show ΔE anomalies in millivolts from ORP sensor (see inset for scale). Red dots are confirmed (solid) or inferred (open) hydrothermal sites from Baker et al. (2017). Yellow highlight on the bathymetry profile indicates extent of new lava flows. Note relatively high ΔE but low ΔNTU anomalies over new lava flows, and high ΔNTU and lower ΔE anomalies over northern-most hydrothermal site, at the Perseverance vent field with black-smoker chimneys. The finding wasn’t just notable for its extraordinary depth. The extremely young age of the lava deposit offers scientists a window into the very beginnings of what happens when a volcanic outburst occurs beneath the seas. So often, they just see an epilogue. “Much of what we know about underwater eruptions, their hydrothermal systems and the biological communities that grow on them is gained from studying old, even ancient, volcanic systems,” said Rebecca Williams, a volcanologist at the University of Hull in England, who wasn’t involved in the research. Commonwealth of the Northern Mariana Islands and the Marianas Trench Marine National Monument ROV Deep Discoverer takes a hydrothermal vent's temperature. Around 80 percent of Earth’s eruptions take place within the oceans. But their depth and remoteness makes finding these near-ubiquitous events difficult. Before 1990, not a single submarine eruption had been detected. Today, even with better instrumentation and exploration, only 40 or so have been found. It doesn’t help that we barely know what the seafloor itself looks like. The deepest-known undersea volcano has been discovered in the western Pacific Ocean. Robotic submersibles are helping to close this information gap. Dr. Chadwick’s team made the initial discovery using an autonomous vehicle named Sentry, which was built by the Woods Hole Oceanographic Institution. Back in 2015, it was perusing the seafloor near where the Pacific tectonic plate is sinking beneath the Philippine Sea plate. To the east, there’s the Mariana Trench and an arc of about 60 underwater volcanic monuments, also called seamounts. 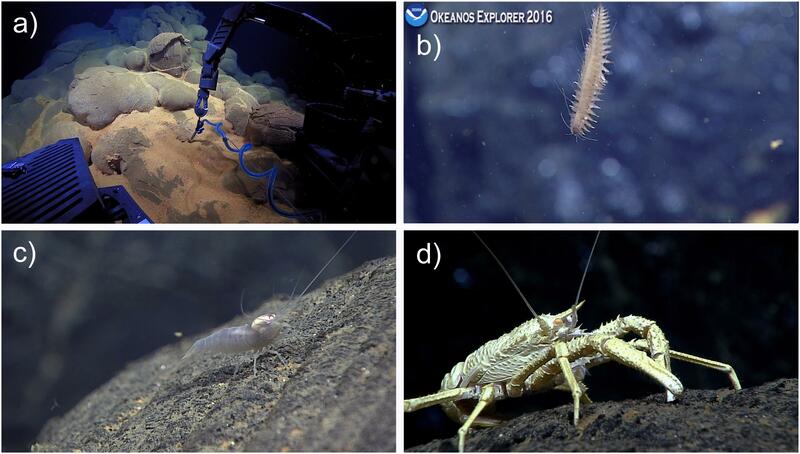 Images made by the Deep Discoverer show, clockwise from top left, a robotic arm measuring temperature near a sea vent, a bristle worm, a squat lobster and a shrimp. To the west of this arc, the seafloor is slowly spreading. Here, in what is known as the Mariana back-arc, additional volcanic activity is possible — and this is where Sentry spotted the prolific lava flows. Old lava flows were expected here, but what the researchers detected is the first known new eruption in the back-arc region. That makes this discovery enormously serendipitous, as eruptions here are only expected every few hundred years or so. Depth changes between ship-based multibeam bathymetric surveys (numbered 1–5 from north to south in Table 1). 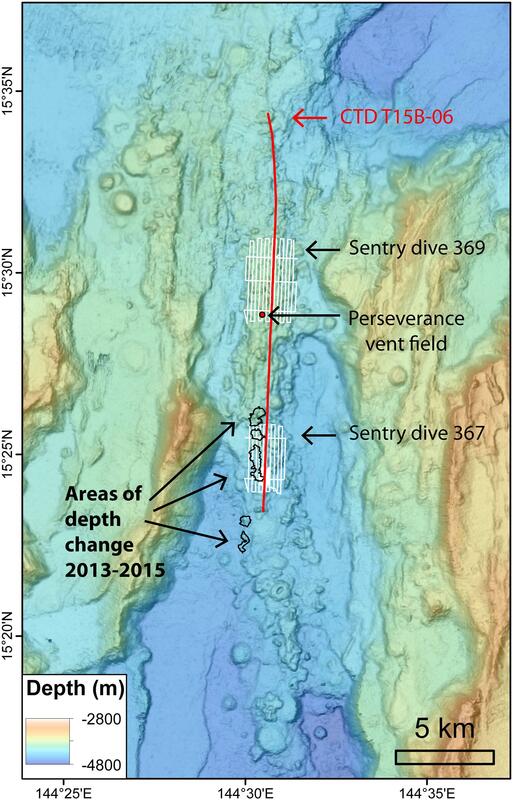 (A) Pre-eruption bathymetry collected in February 2013 by R/V Melville (MV1302a; EM122 sonar). (B) Post-eruption bathymetry collected in December 2015 by R/V Falkor (FK151121; EM302 sonar). 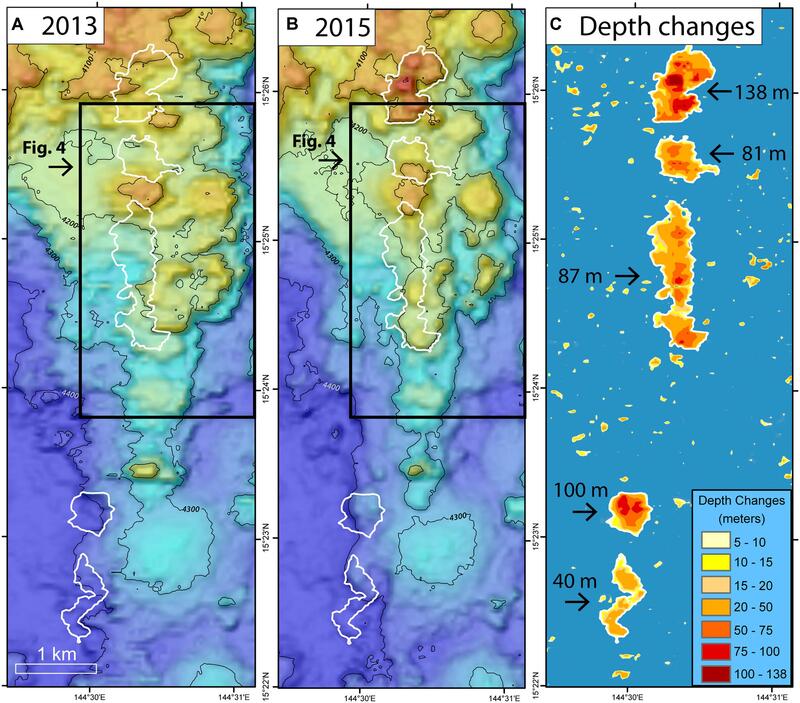 (C) Depth differences between the two surveys showing 5 areas of significant depth change (outlined in white; color scale at lower right). Numbers indicate maximum depth change within each area. Black boxes show area of Figure 4. After small sections of the dark, shiny lava flows were spotted by Sentry’s onboard cameras, bathymetric scans of the area from the researchers’ ship confirmed they are about 4.5 miles long and up to 450 feet thick. Produced by the rapid quenching of lava, the individual protuberances form a surreal collection of glass. Countless bulbous mounds and pillows protruding from the streams are adorned with narrow tubes, which the study authors compare to drips of wax on the outside of a candle. In 2015, sediment had yet to cover the flows, and hydrothermal vents were present. By 2016, the vents had quieted as the flow continued to cool. Speedy, mobile creatures like shrimp and squat lobsters had moved in. The surface was not yet hospitable for slower colonizers like sponges and anemones. Underwater volcanic eruptions and magma flows on the sea floor have been seen for the first time ever thanks to video captured by NOAA in 2009. James Williams talks to the lead scientist on the project to learn the story behind the explosive images. Both the lava’s cooling rate and the incomplete invasion of life indicated the eruption likely took place only months before the team stumbled across it. That youthfulness matters — these fresh rocks provide relatively unaltered insights into the chemical alchemy that produced them. It is also an opportunity to watch diverse communities of living things emerge and change as the hydrothermal system first springs up and then declines. “The closer in time we are to an event like this, I think the more we can learn about its impacts on deep-sea ecosystems and the chemistry of the oceans,” Dr. Chadwick said. The most powerful actors tend to be the most complacent about geography. The last time the United States fought a naval battle was against Iran on April 18, 1988, as part of Operation Praying Mantis. Since then, America’s naval force has operated for almost 30 years in an unprecedentedly permissive maritime environment, during which its complacency about geography has deepened. Gallagher takes the perspective of the American homeland, “a continent-sized island,” as any good congressman ought to do. But we must also turn the map around, lay it flat, and identify the most important places on it before we can determine force posture and force employment. Projections of naval power must overlay what I have termed “key maritime terrain,” an extension of the traditional maritime concept of chokepoints, to be successful. Key maritime terrain is any maritime area whose seizure, retention, or control enables influence over the traffic, flow, or maneuver of military, commercial, illicit, and civilian vessels, communication networks, and resources. Most of today’s geopolitical flashpoints involve access to and influence over key maritime terrain. Some familiar settings persist, like the Strait of Malacca and the Dardanelles. Other maritime backdrops are being transformed intentionally, like China’s construction of artificial islands in the South China Sea, or unintentionally, like the melting of the Arctic as a result of global climate change. Add into this mix, as the National Defense Strategy emphasizes, “revisionist powers and rogue regimes [who] are competing across all dimensions of power,” and “expanding coercion to new fronts, violating principles of sovereignty, exploiting ambiguity, and deliberately blurring the lines between civil and military goals,” and the competitive stage gets cluttered and complicated quickly. All of this suggests the need for a strong, interdependent naval presence — mutually supporting naval forces of the Marine Corps and Navy — acting in and around key maritime terrain. Given America’s waning maritime primacy, locating key maritime terrain is a way of figuring out where competition simmering between peer competitors might first boil over into conflict and opportunities from which to pressure those same competitors. Geography is often thought immutable. But though nature gets a vote, given today’s technologies and the political willpower, there’s significant geopolitical gerrymandering to be done to seize, control, retain, or even build, key maritime terrain. This competition takes place within the contact layer, in which actions remain below the threshold of conventional armed conflict. Short of such conventional conflict, economic, informational, commercial, and military forces, as well as physical currents, flow around the world converging on particular geographic points that can be called key maritime terrain. This article aims to highlight the concept of key maritime terrain and begins to provide what Gallagher requested: a better story about the future of U.S. naval power. Key maritime terrain is identified with respect to each competitor: It may be the same or it may differ depending on the type of power each side wants to project, the capabilities each has to enact that power, and the desired control sought. Most often, though not always, key maritime terrain consists of maritime areas that are also littoral— that is, they lie along a shoreline. The littoral zone is expanding, however, moving further onto land and out to sea due to the range of modern technologies. 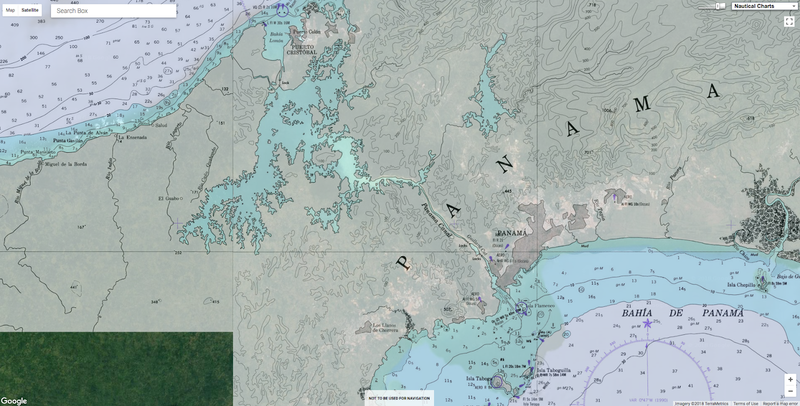 Key maritime terrain is where control (or seizure or retention) is translated into power or vice versa. There is an immense amount of maritime terrain that could be key. Consider the 356,000 km — almost nine equators’ worth — of coastline in the world. Of this, 57 percent is Canadian. Of the remaining 43 percent, Russia holds one-third, totaling 37,653 km, the United States one-fifth, at 19,924 km, and China holds just under one-seventh, at 14,500 km. Additionally, China, Russia, Canada, and the United States possess many islands in surrounding waters. China possesses 14 of the top 20 ports, while Russia’s Far Eastern capital and port, Vladivostok, remains untapped potential. If global trends continue, however, much of Russia’s, America’s, and certainly Canada’s coastline will become reliable options for ports, harbors, and trade routes. The set of possible critical areas is only growing. Additionally, 40 percent of the world’s population lives within 100 km of the coastline, and that percentage will likely increase as more coastline becomes viable. 223 undersea cables systems, which transmit 99 percent of transoceanic data, snake through the ocean like railroads do overland. Their landing stations are critical nodes linking global connectivity and the maritime environment. For example, Guadalcanal, a piece of historically key maritime terrain, has become newly relevant given its potential as a node for undersea cables. In fact, the small South Pacific island already serves as a source of geopolitical and economic competition between Australia and China. Similarly, Russia has continued to threaten undersea cables, even isolating the Crimean population from the internet during its 2014 invasion. All of this occurs around, over, or on key maritime terrain. 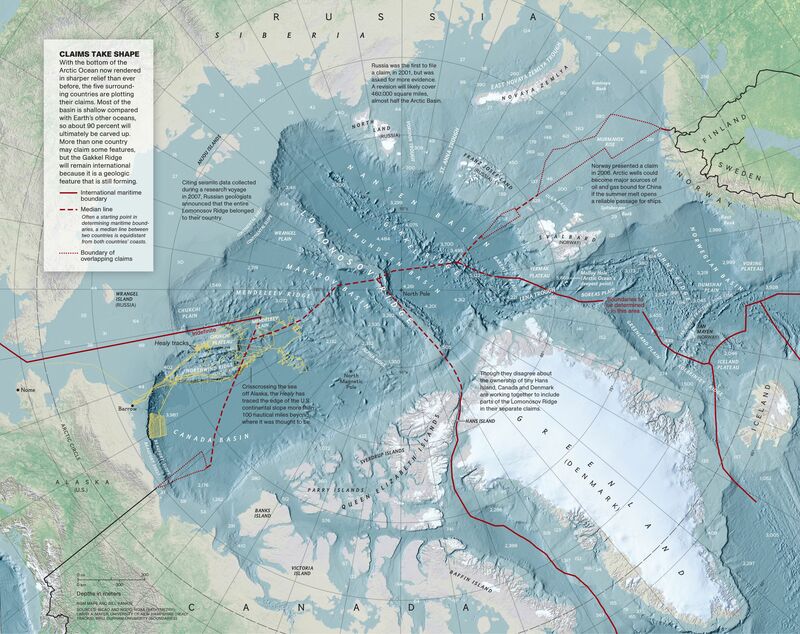 Stepping back and looking at a map can be illuminating. Just overlay maritime shipping traffic patterns and undersea cables against images of the world at night, and the points converge. Add in current and historical sources of tension and the picture is uncanny. 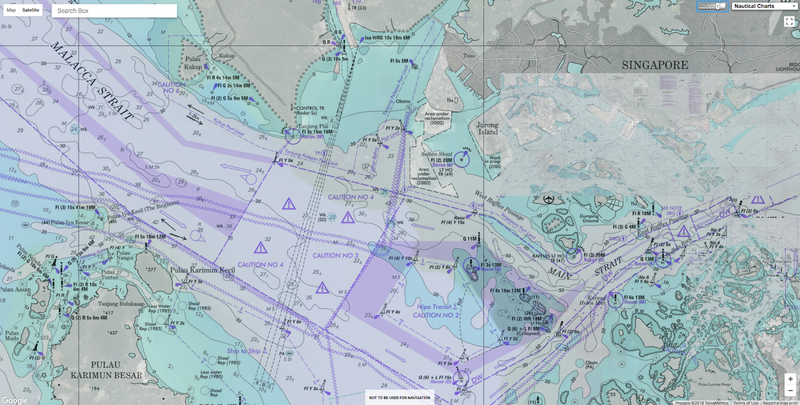 As we identify particular pieces of key maritime terrain, remember that their control governs movement — traffic, flow, or maneuver — in the surrounding environs and to other nodes with which those pieces of terrain are linked. Regional conflict is no longer regional; it extends globally. Through key maritime terrain, naval forces can pressure competitors not just in the immediate vicinity but across the globe. Identifying key maritime terrain does not mean advocating for geographical determinism. Here, I list a number of pressure points that have been historical sources of tension. They are not listed because of that tension, but because there is a historical continuity between chokepoints old and new. Fiber-optic cables have been laid along the same routes as coaxial cables, which matched the earlier routes of telegraphic cables, which in turn were coextensive with the boundaries of the British Empire. 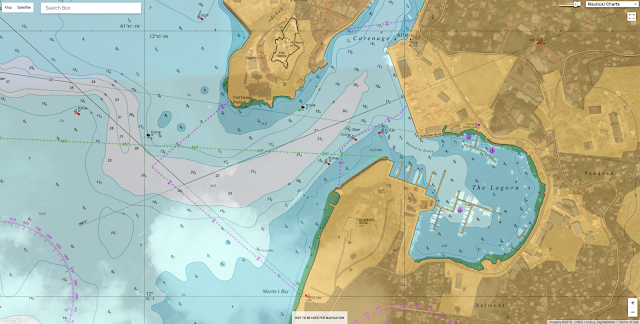 In each of these areas, the economic, commercial (licit and illicit), military, and information currents overlap and are linked to historical maritime and economic traffic patterns. Still, that does not mean that they will persist, just that they have a certain inertia. The Strait of Malacca is arguably the most important chokepoint in the world. Described as the “Fulda Gap” of the 21st century, its geographic and strategic significance has drawn global attention, particularly from India, China, Japan, and the United States. Over 15 million barrels of oil a day pass through the Strait of Malacca, including over 80 percent of China’s oil imports. Only the Strait of Hormuz, situated at the opposite end of the Indian Ocean, sees more barrels pass through by volume, contributing 30 percent of the global supply. Disruption in Malacca could force detours through the Sunda Strait, the Lombok Strait, or even south around Australia. 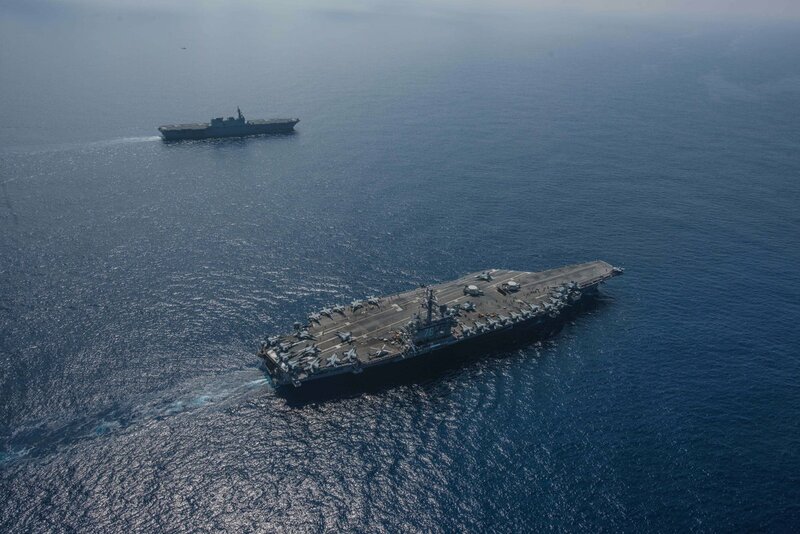 The value of both the Malacca and Hormuz straits will increase in coming decades as trade, commerce, and connectivity continue to expand across the region, underscoring the importance of the U.S. relationship with India. Fortunately, in Thailand, the United States has a mutual defense treaty ally on the northwestern side of the strait, and in Singapore, a long-term and vital strategic partner at the eastern entrance to the chokepoint. U.S. relations with Indonesia are growing closer by the day as well. Still, U.S. naval forces routinely lack capacity to persistently operate in this region. The Panama Canal is still strategically important, and continues to contribute to America’s global power. The canal was recently expanded, allowing ships three times larger than before to pass through. Shipments of natural gas and petroleum increased from Texas, directly benefiting the U.S.
Around 2014, however, there was the possibility of Chinese investment in a Nicaraguan canal to rival the Panama Canal. Construction faltered when the supporting Chinese tycoon lost his funding and Panama established diplomatic ties with China by dropping ties to Taiwan. China’s diplomatic success in this case illustrates how its geopolitical interests can converge thousands of miles away. That same connectivity can be leveraged against peer adversaries. Since key maritime terrain is, in many ways, an eddy for wealth, pirates tend to prey around such areas. Swelling traffic, coupled with regional instability from countries like Venezuela, Malaysia, and Indonesia, has triggered a resurgence of piracy. The Bab-el-Mandeb, the strait between Djibouti and Yemen separating the Red Sea from the Gulf of Aden, is another home to pirates. Operating mostly out of Somalia, these pirates have already forced the world’s navies to devote considerable assets to protecting the free flow of commerce through the region, including undersea cables. Additionally, the ongoing conflict in Yemen threatens the safety of maritime transportation as Houthi rebels targeted a Saudi oil tanker and even U.S.
Piracy is nothing new, and given the confluence of forces, it is unsurprising to find pirates in and around key maritime terrain. The Arctic Ocean could soon emerge as a new strategic transit route with more nations eying its sea lanes to save valuable time on shipping cargo from Asia to Europe, optimizing time and distance between ports. Experts predict that there may be ice-free summers by 2040. Competition will increase over new locations for laying high-speed internet cables to reduce latency between hubs. Additionally, territorial claims overlap as the typical geopolitical distance between competitors is reduced. At its narrowest point the Bering Strait, separating Alaska and Siberia, is only 88 km wide and will increase in importance as climate change opens the Northwest Passage for consistent shipping. The United States and Russia recently proposed ship routing measures to deconflict this growing arctic trade. Yet, at the same time, Russia just conducted a major military exercise in the Bering Sea and also participated in a large-scale exercise with China in the region. Importantly, all of these maritime chokepoints have islands, which are inherently key maritime terrain, in and around them. Islands make it harder for naval forces to maneuver and offer opportunities for adversary forces to exploit. Following China’s lead, Russia began constructing artificial islands in the Barents Sea. Even though China lost its international court case against the Philippines for the surrounding 12 nautical mile control, that terrain remains valuable for the ability to project power. Whether these pressure points are historical, artificial, or emerging, they are the stages on which America’s adversaries are acting. China and Russia have traditionally been seen as continental powers preoccupied with securing their borders and maintaining or acquiring land they consider to be theirs. Whereas Russia has been continental for naturally defined reasons, China is often viewed as continental by choice, though it has a culturally deep maritime legacy. By 2030, the People’s Liberation Army-Navy will be twice the size of the U.S. Navy. The People’s Liberation Army-Navy Marine Corps will increase fivefold, from 20,000 to 100,000 Marines, and expand beyond its current 56 amphibious warships. This is in addition to China’s anti-access/area denial network designed to secure key maritime terrain near its shores. For China, the key maritime terrain in its backyard is the first island chain and second island chain. These are the chokepoints from which China believes it can project power and secure control over the East China Sea and South China Sea. China’s continued construction of artificial islands, disregard for safety and professionalism at sea, strategy for undersea cable dominance, and economic coercion to control ports are disruptive and concerning. This region, however, is just one critical area among many. According to Mackinder, possession of continental and maritime power is a greater threat. Still, Russia is also a maritime power, historically concerned with assuring maritime access in its near abroad. 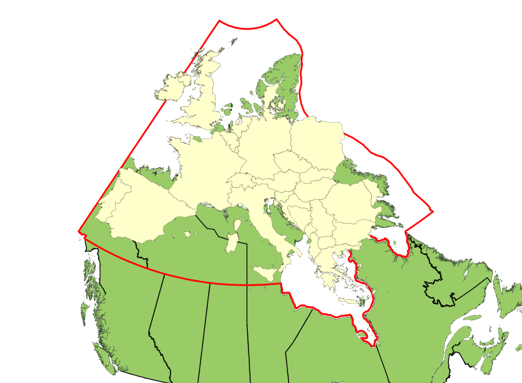 Its expansive territory ensures access to the Pacific and Arctic Oceans as well as the Baltic Sea, Black Sea, Barents Sea, and Sea of Japan, among others. Peter the Great went to war with Sweden to establish Russian control over access to the Baltic Sea, which led to the founding of St. Petersburg. Turkish-Russian wars stretching back to the 17th century revolved around access to sea, including the Caspian Sea and the Black Sea. More recently, Russia invaded Georgia in 2008 to secure control of the Abkhazia province on the shore of the Black Sea and it has since developed an anti-access, area denial network in Kaliningrad in the Baltics. Russia sees itself as a maritime power and takes maritime threats seriously. U.S. and Western European discussions of the Russian threat tend to frame it largely as a problem for land forces, thanks in part to Cold War era fears of a Russian invasion of Western Europe. While such a conflict would primarily be a land conflict, there would still be a significant maritime component. Both the Baltic and Black Seas would offer Russia’s adversaries opportunities through which to contest or turn back Russian expansion, which is why Russia is so concerned with those regions. Additionally, Russia itself features extensive waterways. The Unified Deep Water System of European Russia is a series of inland waterways linking the White Sea, the Baltic Sea, the Volga River, Moscow, the Caspian Sea, and, via the Sea of Azov, the Black Sea. The system allows the transfer of vessels — including potentially warships and submarines — between the Baltic and the Black Seas. From a key maritime terrain perspective, Russia looks far more maritime than what Mackinder’s Heartland suggests. These maritime areas, including its inland waterways, present myriad opportunities for the United States to pressure Russia. For centuries, empires have clashed over key maritime terrain at battles like Salamis, Lepanto, and Trafalgar. While maritime access has always been important due to the military, commercial, and transportation potential of waterways, its importance has only grown as global communications networks and the economy increasingly rely on undersea cables that pass through these same waters. (Interestingly, for China, Taiwan is not key maritime terrain; it is a political objective. A key maritime terrain perspective opens the aperture beyond the South China Sea and Crimea, offering a broader and more accurate perspective on what matters to America’s peer competitors and why. By recalibrating our geographical understanding based on the global flow of economic, informational, commercial, and military traffic, forces, and networks in and around key maritime terrain, we can highlight potential pressure points, some of which are familiar, and others that are new. All are potential areas of competition since the pressure now ripples globally in a way that it did not in the past. Given the global maritime influence of Russia and China, it is likely that the next crisis or regional conflict will occur within the operational reach of U.S. Successful naval maneuver requires focusing attention on the selection, reconnaissance, and control of air, surface, and subsurface interdependence. It requires varied naval craft and distributed naval forces. It places a premium on deception, intelligence, surveillance, reconnaissance, cyber operations, and, of course, logistics. Success demands a naval force capable of maneuvering throughout the littorals to expand the operating area, confuse the enemy, and dilute their “home field” advantage by exploiting America’s own asymmetric advantages. Such action will inevitably develop in, around, and about key maritime terrain. Identifying key maritime terrain highlights potential nodes where competition might become conflict, where the contact layer might become blunt. To compete effectively, and tell a better maritime “story,” we must first figure out where to look. VanGuardCanada : Is the Canadian Arctic more secure now?